(The Belleville Times - March 14, 1968) -- "Since he had to leave this world, I'm glad he left it the way he did, with courage and fighting for his country." There was little else for William D. Saunders of 20 High Street, Belleville, to say. He is the father of Pfc. Donald Saunders who was killed in action in Vietnam recently. The young Saunders, only 20, died of wounds on his head and body from an enemy mortar fire in Quang Tri last week. Saunders was killed while defending the Marine Corps combat base of Khe Sanh during the 77-day siege. Saunders enlisted in the Marines two years ago on Sept. 28. It was a day that William Saunders will never forget as it was the elder Saunders' birthday. Donald completed his basic training at Parris Island, S.C., and advanced infantry training at Camp Lejeune, N.C. He volunteered for duty in Vietnam. When asked why, Mrs. Maisie Saunders, his mother, said, "Donald was never too talkative. He made his own decisions. I think he felt the boys were doing a good job and he should back them up." "It was just a job that had to be done, for him," added Saunders, and he never complained. In all his letters there was never a word of complaint. He tried to reassure us, in fact." Mrs. Saunders states that Donald did mention in one letter that he did not know whether it was the last letter or not and that they were surrounded by the enemy. According to his mother, the difficulties of the people of Vietnam particularly affected him. He wrote home about the villagers who had to scramble for food and were so starved that they were eating garbage. Donald did manage to telephone home just two weeks ago at 3 a.m. to talk to his parents. This is how Mrs. Saunders remembers the call: "We were surprised and so happy to hear his voice. The first thing he said was 'don't talk about anything military, Mom.' There was so much confusion because of the relay through Hawaii that we could not say very much. I said something an then had to wait for it to be relayed. He did say though 'What's happening, Mom' which was his favorite expression. It was so good to hear that. I only wish we could have talked much longer, it was over so quickly, so very quickly." A member of the First Battalion of the 13th Marines, Pfc. Saunders attended Belleville High School. He was a member of the cross-country team that one the Big Ten Conference Championship in 1965. He was also a member of Little Zion U AME Church in Belleville. Of the military conditions in Vietnam, Saunders never said a great deal, according to his family. "Of course," Mrs. Saunders said, "he sometimes wrote that he gave candy and food to the Vietnamese children. The only thing he really asked for was undershirts. It seems that you could not purchase them over there because of the climate." "When he enlisted," the senior Saunders adds, "we hoped for the best, we did not want anything to happen. But we knew he was was on a machine gun and the first thought of any enemy is to knock out machine gun out. "At least he wasn't like those doves or slobs, who try to find any excuse to get out of going. That's the one thing I remember, he never, even after he was in combat, said he was sorry or complained." Pfc. Saunders leaves besides his parents, a brother Kenneth, who is 16 years-old and a sister, Miss Kathleen, both at home. The body is expected to arrive later this week and the funeral will be from the William V. Irvine and Son Memorial Home. The following is adapted from a brief talk by Anthony Buccino at the street sign memorial dedication at Van Houten Place and High Street, Belleville, N.J., on Saturday, September 19, 2015. Pfc. Donald Baron Saunders was the fifth of eleven young Belleville men who died in the Vietnam War. In the past 150 years, Belleville lost 159 sons while in service to our country. 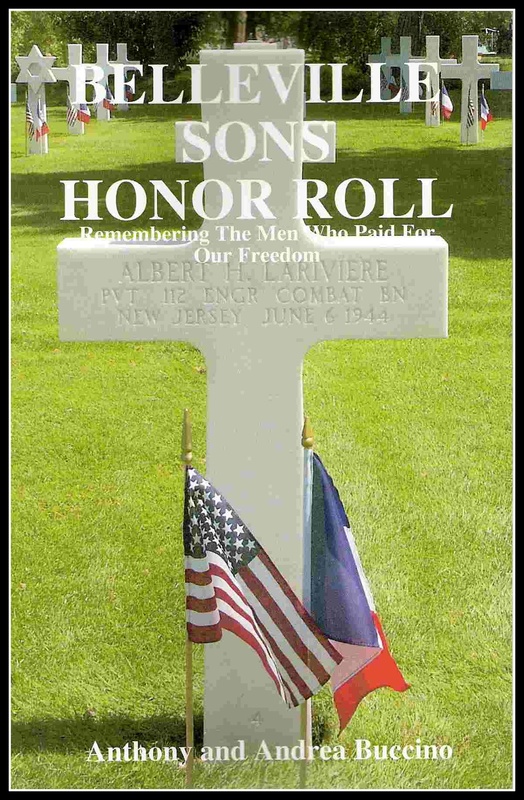 More than a dozen years ago we began the Belleville Sons Honor Roll project where we gathered from newspaper clippings, war memorials and government records all we could learn about these 159 young men in an effort that their sacrifice not be forgotten. 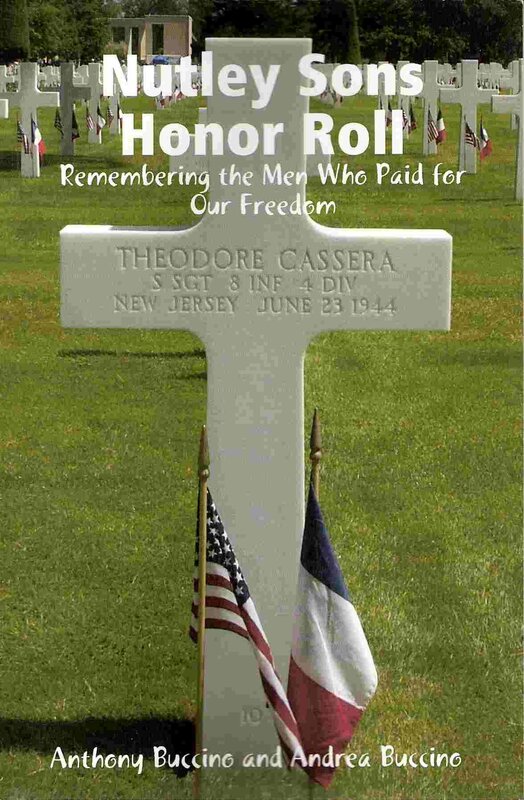 You can read their stories in "Belleville Sons Honor Roll - Remembering the Men Who Paid for Our Freedom" which my daughter Andrea and I compiled. Former Belleville Fire Chief George Sbarra also contributed to the research. In February 2015, Belleville Township Council approved a resolution to dedicate High Street in honor of former Belleville resident Donald Baron Saunders, who was killed in action on March 4, 1968, while serving with the U.S. Marines in the Vietnam War. Council members Kevin Kennedy and Vincent Cozzarelli are here today. Thank you for undertaking this effort to honor all 159 Belleville sons who died while in service. Behind you, the Belleville Middle School was the high school where most of these men learned the value of life and community. They walked the halls, sat in those classrooms, played music in the auditorium, danced in the gym and marched to Clearman Field to play football. My wife, Mrs. Dawn Buccino, retired last year after teaching English for 38 years at Belleville Middle School, which was formerly Belleville High School. Through the years I spoke to several eighth grade classes in a full auditorium. I told half of the students in the auditorium to stand and told them that about that many young men from Belleville died in service to their country. After my talk, I read the street names where the soldiers lived. One student came up to me afterwards and said I announced his street name three times. I said, that’s because three men from your street died in service. For her last few years in the building, my wife and her Social Studies partner did a Belleville Sons project with their 8th graders. She assigned one of the 11 men killed in Vietnam to each student. Then the student would research that man, and make a poster honoring our Belleville Sons. Her goal was to not only inform the students of the toll the Vietnam took on our little town, but to also help them understand the sacrifices of these young men, who were students right in her building back when it was BHS. The students quickly made those personal connections and would soon begin referring to the man they were honoring as “my guy”. My wife was quick to point out the house where Donald Saunders lived (since you could see it from her classroom window) and the students would “pay their respects” every time they went out to High Street for a fire drill. The posters the students created were amazing - each one was touching and helped to be sure that Belleville students Never Forget! In 2006, seven streets at Essex Park were renamed to honor veterans and four of the Belleville heroes who died while in service. Streets were named for Raymond De Luca, Carmine Olivo, Clatie Cunningham Jr. and William Hamilton. · Army Spec. 4 Raymond P. De Luca, of Meacham Street, died June 27, 1968, as a result of wounds in a firefight in Vietnam. De Luca attended Essex Catholic High School, Newark, where he graduated as an honor student in 1966. He was trained as a medic at Ft. Sam Houston in Texas, he was attached to Company C, Ninth Medical Battalion, 9th Infantry. · Sgt. Carmen Olivo, 29, of Magnolia Street, was killed when his ship was sunk in the English Channel during the invasion of Normandy, France. He is listed as killed in action on June 9, 1944. · Staff Sergeant Clatie Ray Cunningham Jr., was killed in action on a mission over the Mekong River in French Indo-China, or Vietnam, on July 23, 1945. Cunningham Jr., 23, was survived by his wife Alice Sylvia, of Stephens Street, and twin sons Clatie III and John W, born June 5, 1945, whom he never saw. · Sgt. William Hamilton was killed in action in Germany on April 2, 1945. He served with the 7th Army. Hamilton lived on Arthur Street for years before he entered the service in 1942. The street name changes also include Memorial Drive, Hero Way and Freedom Lane. There was no dedication ceremony for those street names. And now they are in a gated community. · Donald plans to become president. Watching television occupies much of his time. He admires Peter Snell, Olympic gold medal winner. Saunders was remembered by friends on the 45th anniversary as a humble young man who had a smile as wide as his athletic talents. He also held one of the most prestigious athletic records at Belleville High. Anthony - I hope all is well ... 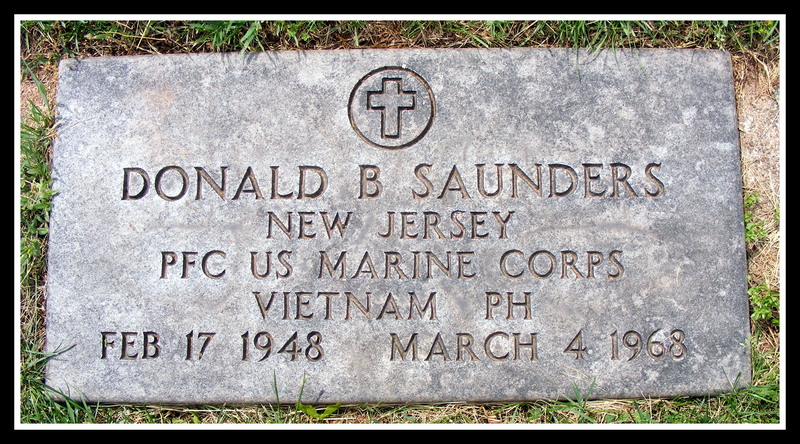 I just wanted you to know that March 4th is the date Donald B. Saunders was Killed In Action while defending the Marine Corps Combat Base of Khe Sanh in what was then the country of South Vietnam. I thought it important that you know I continue to mourn his loss and remember what a fine brave Marine his was. We who survived that horrific siege are all some of them have left who remember their sacrifice. The mention of Quang Tri as the site of his death is like naming a county or state, as Quang Tri is both a city and providence. More important is that Donald was killed during the horrific and deadly 77 day Siege of the United State Marine Corps Combat Base of Khe Sanh -- while he was assisting other Marines in fortifying their bunkers from an incoming attack of artillery, rockets and mortar fire. I just wanted to make that fact clear as it personalizes his death a little more. I knew Donald at Khe Sanh and talked to him just before he was killed. One little additional point I wanted to make, and that was that Donald did this while unselfishly exposing himself to the intense incoming fire of the enemy - a fact one does not always hear from the government. Craig Tourte wanted to be here today but he lives in California. He would also like to correspond with Saunders’ family members. PFC Donald Saunder's brother Kenneth Saunders, center, is joined by family and friends at the memorial dedication to the brave young Marine killed in action on March 4, 1968 at Khe Sanh, South Vietnam. We need to remember the sacrifice Donald Saunders’ family made. It surfaces in the Belleville Times article on March 14, 1968, at the report of his death. Pfc. Saunders leaves besides his parents William and Maisie, a brother Kenneth, 16 at the time, and a sister, Kathleen, both at home, 27-29 High Street. "Since he had to leave this world, I'm glad he left it the way he did, with courage and fighting for his country." There was little else for William D. Saunders of 20 High Street, Belleville, to say. The young Saunders, only 20, died of wounds on his head and body from an enemy mortar fire in Quang Tri. Saunders was killed while defending the Marine Corps combat base of Khe Sanh. Saunders enlisted in the Marines two years earlier on his father’s birthday. A member of the First Battalion of the 13th Marines, Pfc. Saunders attended Belleville High School. He was also a member of Little Zion U AME Church in Belleville. Donald completed his basic training at Parris Island, S.C., and advanced infantry training at Camp Lejeune, N.C. He volunteered for duty in Vietnam. His mother, Mrs. Maisie Saunders, said, "Donald was never too talkative. He made his own decisions. I think he felt the boys were doing a good job and he should back them up." Mrs. Saunders said Donald did mention in one letter that he did not know whether it was the last letter or not and that they were surrounded by the enemy. She told the Times that the difficulties of the people of Vietnam particularly affected him. He wrote home about the villagers who had to scramble for food and were so starved that they were eating garbage. About two weeks before he was killed, Donald managed to telephone home -- at 3 a.m. -- to talk to his parents. Mrs. Saunders said: "We were surprised and so happy to hear his voice. The first thing he said was 'don't talk about anything military, Mom.' There was so much confusion because of the relay through Hawaii that we could not say very much. I said something and then had to wait for it to be relayed. He did say though, 'What's happening, Mom' which was his favorite expression. It was so good to hear that. I only wish we could have talked much longer, it was over so quickly, so very quickly." Mrs. Saunders told the Times her son never said much about military conditions in South Vietnam. Mrs. Saunders said, "He sometimes wrote that he gave candy and food to the Vietnamese children. The only thing he really asked for was undershirts. It seems that you could not purchase them over there because of the climate." His dad told the Times, "When he enlisted, we hoped for the best, we did not want anything to happen. But we knew he was on a machine gun and the first thought of any enemy is to knock out machine gun out. At least he wasn't like those doves or slobs, who try to find any excuse to get out of going. That's the one thing I remember, he never, even after he was in combat, said he was sorry or complained." Donald Saunders is buried in the Laurel section of Glendale Cemetery, Bloomfield, N.J.
We are here today to honor Pfc. Donald Saunders, a young man from this town, Belleville, from this street, High Street, from that house who answered his country’s call in a difficult time. Pfc. Donald Saunders volunteered to go to South Vietnam with the Marines. He was killed in action while unselfishly exposing himself to the intense incoming fire of the enemy. He loved his family. He loved his hometown. He loved his fellow Marines. He loved his country. Here, today, we post this marker, this memorial to one of Belleville’s best, Belleville’s bravest. We salute you, Pfc. Donald Baron Saunders. We will not forget you or the 158 other Belleville sons who paid for our freedom with your lives. Van Houten Place at High St. Available in paperback, Nook, Kindle and Amazon. 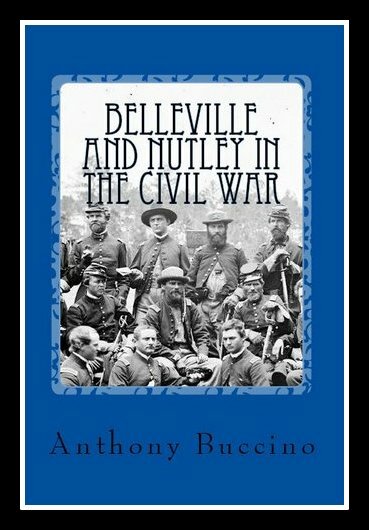 A compilation documenting the participation of the New Jersey towns of Belleville and Nutley in the American Civil War. Publication includes information on six local soldiers killed in action in the War Between the States, plus information on the battle campaigns in which they gave up their lives.